No more screen resizing with AppRadio One? In a press release put out just a few hours ago, Pioneer Electronics announced release of its next generation AppRadio Mode functionality called "AppRadio One." The feature will be available only for the recently announced 2015 line of head units via a firmware update. What is AppRadio One and how does it work? There are plenty of other such questions that come to mind. With whatever information that's available at the moment, I have put together a list of questions and possible answers that might help explain AppRadio One a little better. 1. What is AppRadio One? AppRadio One is basically improved AppRadio Mode. The name 'AppRadio One' comes from the fact that you will need only one cable to use the feature with a compatible head unit. Current head units require complex cable kits to use AppRadio Mode. For example, the AppRadio 4 requires an HDMI Cable, USB Lightning Cable, and an Apple Lightning Digital AV Adapter to work. Or you can buy Pioneer's CD-IH202 and CD-IU52 kits for iPhone 5 and later. With AppRadio One, iOS users will need the Pioneer CD-IU52 kit or the USB to lightning cable that comes with your phone. On the Android front, users will be able to use the Pioneer CD-MU200 USB to microUSB cable or just the microUSB cable that comes with your phone to use AppRadio One. 2. Which head units support AppRadio One? 3. When will the firmware update be available? The firmware update for the seven head units mentioned above is already available through Pioneer's website. Visit the page for the corresponding head unit and click on the 'Firmware & Software' tab to download the update and instructions. In addition to AppRadio One, the firmware update adds iDataLink Maestro compatibility to the five 2015 DVD head units (AVH-X5700BHS, AVH-X4700BS, AVH-X3700BHS, AVH-X2700BS, AVH-X1700S). With iDataLink Maestro consumers can retain many of the original features found on the stock radio in their vehicles. These include services such as OnStar, Sync, uConnect, SiriusXM, Bluetooth and more. Users can access such factory features directly from the built-in touchscreen display of the head unit and even project data information onto factory installed displays. 4. What about the current NEX receivers or AppRadio 4 (SPH-DA120)? Looks like NEX, AppRadio 4 and previous generation AppRadios, and none of the other GPS, DVD and Digital Media receivers will support AppRadio One. 5. Will AppRadio One work better than AppRadio Mode in any way? From the screenshots that are available on Pioneer's website, and I may be going out on a limb here, looks like most of the display issues that haunt current AppRadio Mode head units won't affect AppRadio One. The biggest one is the screen resizing issue. AppRadio Mode users are all too familiar with the resized display when using an iOS device with lightning connectivity. The smaller screen resolution is quite annoying. Well, with Pioneer ditching the Apple Lightning Digital AV Adapter in AppRadio One, looks like the screen resizing issue won't be a problem in the 2015 head units. 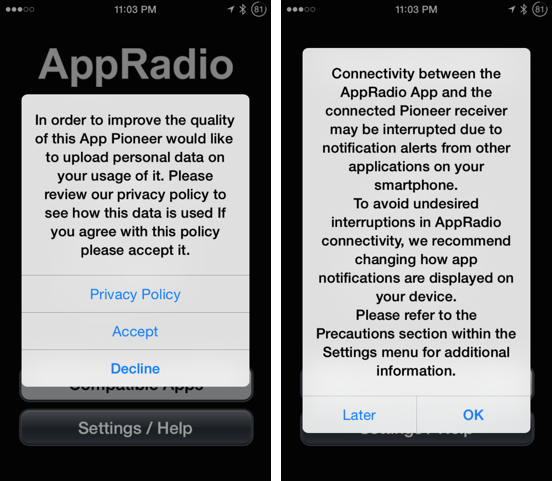 Pioneer recently updated its AppRadio app and its becoming evident that they did so to add AppRadio One compatibility, although the app description didn't mention it. The website doesn't mention the need of a separate AppRadio app. Other details on whether AppRadio One is different from AppRadio Mode in any way will be available shortly. 6. What about those annoying pop-ups and safety warning messages? Pioneer displayed a new warning message when I updated my AppRadio app the other day, which talked about how notifications can interrupt your AppRadio connectivity. So may be those interruptions will continue to affect connectivity for now. Specific details on AppRadio One are not available at the moment though. Stay tuned. 7. Which third-party apps will work with AppRadio One? Pioneer's website mentions only AppRadioLIVE as being AppRadio One-compatible. But the press release mentions AppRadioLIVE as being "one of the compatible" apps that works with AppRadio One. It appears that third-party app developers will have to add AppRadio One-compatibility to their apps to make them work with AppRadio One. No details on this front are available at the moment. There is speculation on whether AppRadio Mode-compatible apps will work with AppRadio One, but seems like they won't work at the moment unless the developer adds compatibility. Through AppRadioLIVE, Pioneer uses third-party app services to deliver connected content on the head unit. For example, mapping services are provided by the native map application on your smartphone overlaid with INRIX live traffic data. Events are supplied through Eventseeker and Facebook, RSS feeds through Feedly and weather info through Open Weather Map. I'm sure a lot of you have a ton of other questions regarding AppRadio One. More details will be available in the coming weeks. 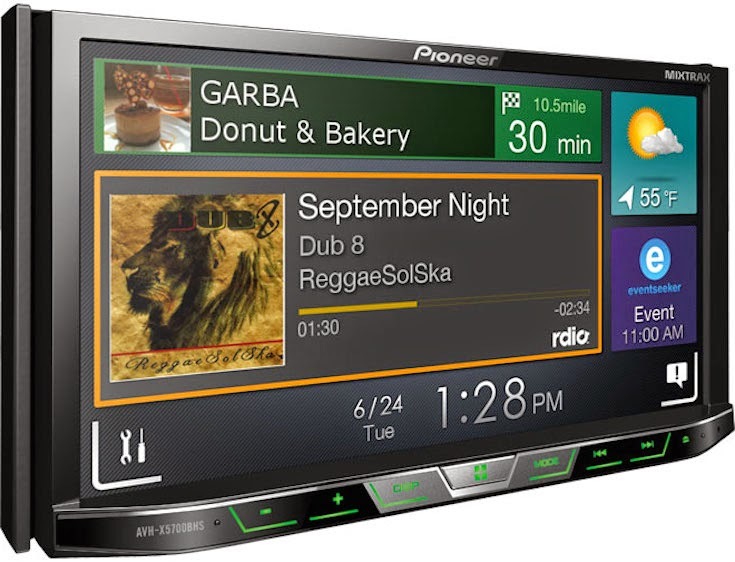 Looks like Pioneer will feature its 2015 line of head units with the latest AppRadio One connectivity at CES 2015 next month in Las Vegas. I am interested in seeing which third-party apps will be added to AppRadio One and whether those interfaces will be any different from AppRadio Mode. Is it possible that a firmware update to NEX and AppRadio 4 head units could come at some point that adds AppRadio One compatibility? Judging by the way Pioneer has dealt out new features in the past, it doesn't seem likely. Maybe AppRadio One is a hardware feature too, that is built-in into the 2015 models only. The 2015 models do not support Apple CarPlay. For my money, AppRadio Mode was on its dying breaths but AppRadio One may inject some life into the feature. Especially if future head units will allow CarPlay and AppRadio One switching with the click of a button. AppRadio 5 later next year maybe? I can totally see how that will be marketed too. For now, you can check out all the available info that Pioneer has put out on its website. Stay tuned for more. Ditching the HDMI and Digital AV adapter for iOS users is great news, but why don't these units support CarPlay? This Pioneer product is virtually useless in its present form. AppRadioLive is a (4) element 'console'/menu system; that interfaces with 'compatible' apps on the smartphone. Maps, Media, Events, and Calendar. Maps - while it will display a "map" of sorts, there are NO navigation apps that are compatible. NO Google maps, Navfree, Waze, etc. NONE are compatible. Media - Only rRdio works (which is a paid subscription - otherwise, only 30 seconds of each song plays). It will play media files saved on the smartphone. Pandora will not work from within AppRadioLive. Pandora will work after exiting AppRadioLive. The concept is good, if it worked in practice. In the middle of the Pioneer AppRadioLIVE website is the statement "YOUR favorite Apps in one place" - flat out false advertising. http://www.pioneerappradiolive.com/ Another false statement on the site "AppRadioLIVE uses the native maps from your smartphone" - I have Navfree, which downloads maps to the smartphone, and AppRadioLIVE does not use the maps. Completely agree with all here. I wasted my money on an appradio 3 and feel totally cheated. I use TuneIn radio constantly and the only way to get it properly is vua6the Samsung Mirrorlink connection. The downside is that the AppRadio 3 used Mirrorlink 1.0 and now everything is 1.1 but wait! They aren't compatible! No firmware from Pioneer to update the Mirrorlink version meaning all new phones don't work unless you use AppRadio mode. Any phone past the S3 won't work in Mirrorlink mode. The S3 even has issues by going to a black screen and "communication error" displayed after a few minutes of use. This is usually after audio has been used in some way. A sat nav instruction or TuneIn stream has started. I'll never buy a Pioneer Appradio again. The unit was only bought brand new from Halfords a few months back and is seriously obsolete already. Rdio is the worst thing ever, maps are shocking, battery runs flat while using it. How did these even get a release? They could have used MHL which powers the device properly and can supply touch. The HDMI connection to MHL doesn't cut it. It's just converting. If only MHL was straight to the unit. On a side note if you plot a route in the AppRadio Live mapping app using a postcode search or location then you'll see an icon at the far right of the screen, this opens up another mapping app. I open it up in Waze this way (but it exits the live view!). yeah, just got a AVH-X1700S head unit and downloaded the three appradio apps (appradio, appradio live, appradio keyboard). first, it is killing the battery life on my 2013 Moto X.
second, i cant figure out how to make it work consistently. sometimes it mirrors the appradio live screen, other times, the head unit screen goes dark but touching it activates what is shown on my phone - like its being mirrored to the head unit but just not showing the graphics. sometimes i can get it to hook up to the appradio app/phone, other times i have to spend 5 minutes in my driveway lugging and unplugging the cable until it registers. audio is hit or miss. sometimes it works, sometimes it doesnt. sometimes it cuts out in the middle of a song. sometimes switching over to an app (like spotify) will work, sometimes it disconnects. I have an AVH-X4800BS. All I want to do is control my Samsung Galaxy S5 from the Head Unit screen. Either that or, find some apps that are compatible with AppRadio One. I have Navmii but want other apps as well. Hate AppRadioLive. Only apps that are app radio live compatible will show up with AppRadio. The only genuine mirror that you will be able to get, is with MirrorLink. And that is no longer a contender between apple cardplayer, and Google Android auto. I bought a Sony xperia phone for the MirrorLink feature, and it is awesome with this unit. AppRadio live was not worth 2 cents, ( to me). Just got a new S7 and it has Mirrorlink. Can I just use that on the AVH-X4800BS instead of AppRadio or AppRadio Live? Does one have to hook up with AppRadio or can one connect with just Mirrorlink and the applications that are certified to use it?